Drill Team Six won the top prize in the George R. Brown Engineering Design Showcase held April 11 at Rice University’s Tudor Fieldhouse. The Excellence in Engineering Award includes a prize of $5,000. The team has created a device to simplify the placement of screws that secure metal rods to fractured bones in limbs. The process could cut the time, effort and number of X-rays necessary to complete the procedure. Willy Revolution Award for Outstanding Innovation ($3,500): BuoyBOTS. Willy Revolution Award for Outstanding Innovation ($1,500): Take a Breather. Willy Revolution Award for Outstanding Innovation ($500): UV Chamber. Excellence in Capstone Engineering Design Award ($1,000): M&M. Excellence in Capstone Engineering Design Award ($1,000): EasyScope. Excellence in Independent, Multi-year or Club Engineering Design Award ($1,000): OxyMon. Excellence in Freshman Engineering Design Award ($1,000): EquestriCAN. Best Interdisciplinary Engineering Design Award ($750): Take A Breather. Best Conceptual or Computational Modeling Engineering Design Award ($500): PIONEER. Best Technology for Low-Resource Settings Design Award ($500): Clean Machine. Best Energy-Related Engineering Design Award ($500): M&M and Crossing Streams. Best Robotic Technology Award ($500): Mechatron. Best Medical Technology Award ($500): Lapras. Best Environment and Sustainability Engineering Design Award ($500): Flood. Best Gaming, Creative or Innovative Technology Award ($500): Vignette. Best Aerospace or Transportation Technology Award ($500): Club Rice Eclipse-Luna. People’s Choice Award ($500): Biofuels Production Group. 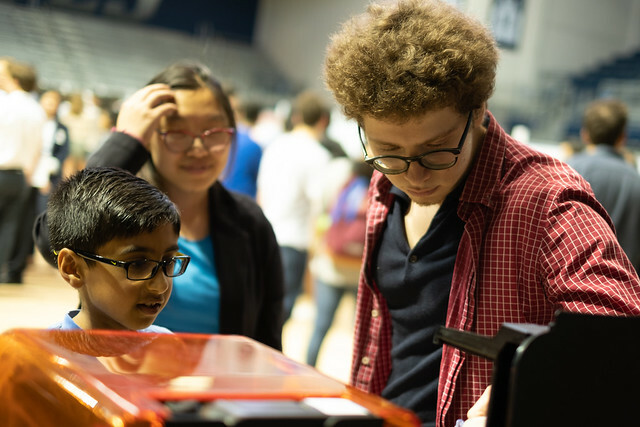 The annual public event put on by the Brown School of Engineering and the Oshman Engineering Design Kitchen features senior capstone design and other projects by Rice undergraduates. Read about all the participating teams at http://oedk.rice.edu/showcase.